True glamour never dies. It evolves. Welcome to a new era, a time of confident textures and shimmer finishes. A time to celebrate the classic. Redefine your own brand of glamourous. I’m with them on “vivacious lipsticks and shimmering nail polishes”, but I already have “the brows that do all the talking” and I hate those from the bottom of my heart. Let’s start with the nail polishes. I don’t think Illamasqua labeled these as liquid/crystal sand finish nail polishes, but they look exactly like those to me. Gritty surface, quick to dry and full of yummy glitter. And the application – smooth, good coverage after first coat, they dry fast even when somebody we won’t name, puts second coat right after the first one. Blame it on hormones, but I put top coat on the pinkie and ring finger, then remembered that finish if possibly the point here and top coat should be left out. So you get the chance to see how it looks in gritty and glossy state. I guess this formula can go either way, but as Illamasqua only mentions shimmer, sand finish is just the bonus. 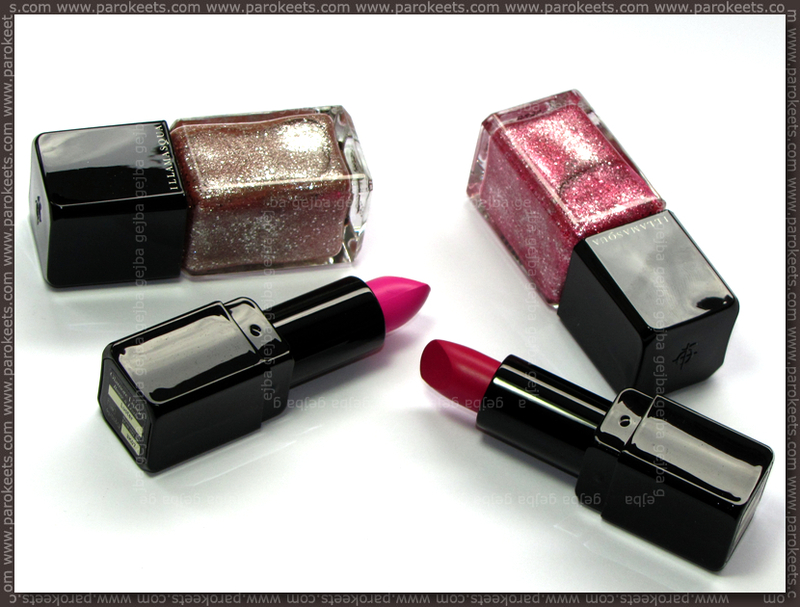 I received Trilliant and Fire Rose nail polishes from Illamasqua Glamore to play with. Both formulas look identical to me and above description goes for both shades. Trilliant is beige-silver bottle of sparkle and shine (Illamasqua classifies it as champagne) and Fire Rose in rose-silver combination. I really adored how base is filled with color and shimmer and then you get larger glitter particles that are very well suspended in base as a bonus. My first thought when I read the accompanying letter, “They went with satin finish?” I would say that satin or semi matte finish is my favorite, but for some reason, majority of satin formulas just gets butchered up so I prefer either matte or more “moisturizing” lipsticks. I really don’t want to jinx this formula and rave about it from the matte lipstick loving bottom of my heart, but so far Illamasqua’s satin finish is working for me. 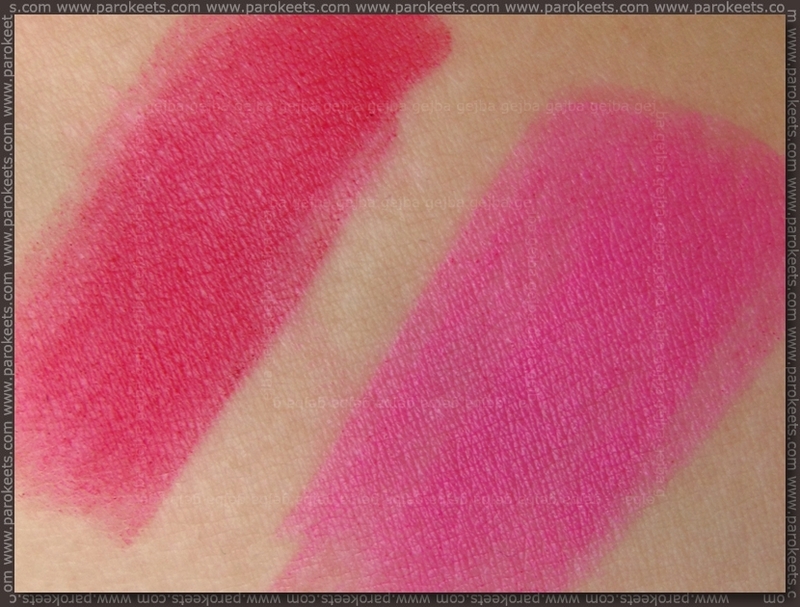 It is long-wearing, staining and rich in color formula that still feels “glossy” on the lips. Is more forgiving on my chafed lips than matte formula. But we will see how it performs in the future. I wore Glissade more as it is more my kind of shade than Luster. Glissade is darker, more muted and looks to have maybe some purple in it, while Luster is bold, bright and really pink, pink shade. Scent is the same as with other Illamasqua lipsticks I own – something that smells slightly vanilla(?) to me and without those obnoxious heavy perfume smells some companies go for. I did notice one thing though – if I want color to be really “stuck onto my lips” I have to leave it little bit to dry. The only thing left now is to go and ask uncle Google if Marquise nail polish and Soaked lipsticks are as pretty and good as those that I receive so I can grab them as soon as they become available. Glamore will be available from 27th February 2014. I am trying SO hard to convince myself that I do NOT “need” Glissade. 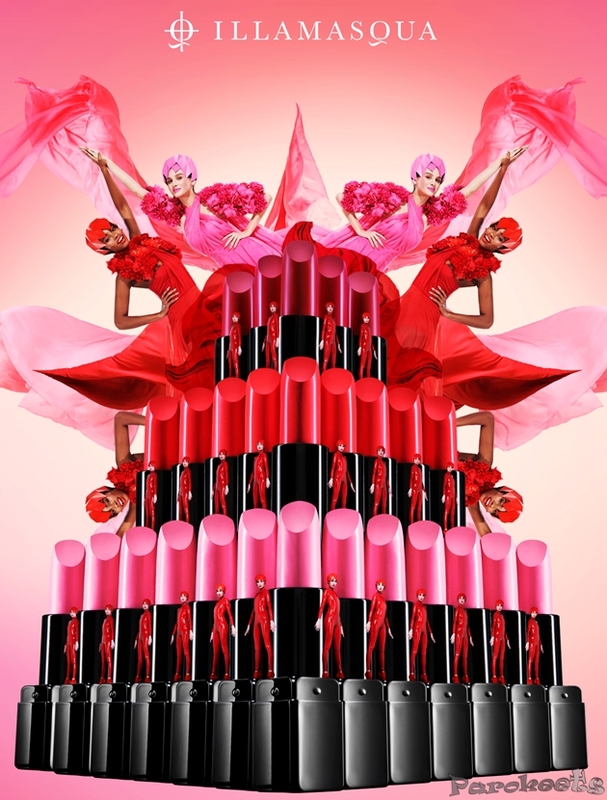 Toward that end: Are there dupes, especially in MAC?